Of course, one expects there to be a certain amount of upset when a community is in the midst of construction, especially such a huge project as the (unwanted, unneeded) wind power project on Amherst Island. But residents there are deeply concerned over unscheduled road closures, road blockages and more. On Tuesday, a resident reports, roads were closed so that people could not leave their properties at all—questions were raised about access by emergency vehicles, should they have been needed. 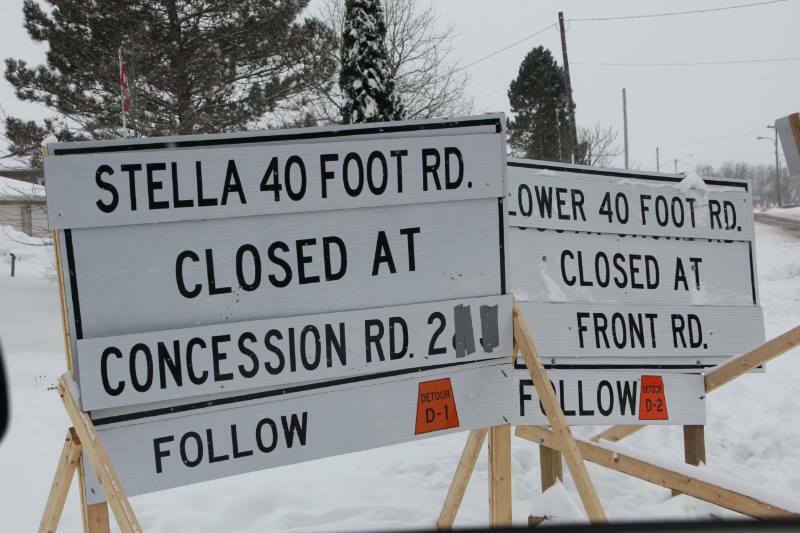 In a recent report by Global News, residents state that unscheduled road closures have meant missed ferry trips to the mainland, but there is more. The local mayor says the wind power developer is actually out of compliance with agreements and contract conditions. Loyalist Township Mayor Bill Lowry says he’s exhausted and frustrated that promises that were made to the municipality have been broken. He says residents are voicing their concerns to council but their patience is running out. “How long do we have to take this, how long does the island have to take this? It’s been far too long, we’ve been three months of being out of compliance,” Lowry, told Global News. Where is the Ministry of the Environment and Climate Change? Where is the IESO? Where is the Ontario Ministry of Labour? Where are the government assurances of a better, safe environment for the people of Amherst Island? ……..and soon Wynne will retire with a pocket full of money!!!!! The exact same questions we have in Bala. At http://www.savethebalafalls.com. only difference being Amherst Island Mayor is supporting his community he represents. It is so disappointing and disillusioning to have your paid and elected leaders ignoring and even mocking residents who are experiencing serious distress because of the incursion of industrial wind. In Ashfield Colborne Wawanosh there is a Councillor who said that as a Canadian it was her democratic right to vote against the people being harmed who had been reporting the harm for many months. She openly voted in support of the leaseholders. People being harmed were sitting in the Council Chambers, right in front of her, and she had no qualms about saying that. It was piercing cruelty and it left an indelible impression. After all that other communities have gone through, it is so sad to think that the people of Bala are having to go through this now. What will the impact be on tourism? Isn’t this (Bala) clean-green hydro base-load power that can be supplied to the grid and maybe even sold outside the province? Weve got a councillor that continually votes against his constituents 84% opposition to the wind project…. Here is a recent link from Engineers Ireland. Please read the article and comments following. Already 145 comments are posted. Please note the following published at the end of the above article. Why are Engineers Ireland pointing to a decision made by a government agency in Australia? Now I wonder who wrote the article! I really think the mayor knew about this but anyway here is how I predict some of the disruptions. It is possible to get some road deviations or bypasses and even some closures in advance by using Google Earth Satelite maps and noticing where the width is not at least 40 feet. Also any tight corners will need modification but probably not a closure. I spotted a couple trees on Front Rd that might get a trim also. The hydro poles can be clearly seen and their shadow gives an approximate height, type and if it has a residential transformer. Any place where the line crosses the road could require a temporary disconnect so simply follow that line and all users on the load side will be affected. I see only one on Dump road with no dwelling so no problem there but the rest have multiple crossings so possible grief. The feeder section can easily be seen at the waters edge. The Ministry also has drone videos and stills but maybe not for public viewing, ask the mayor.